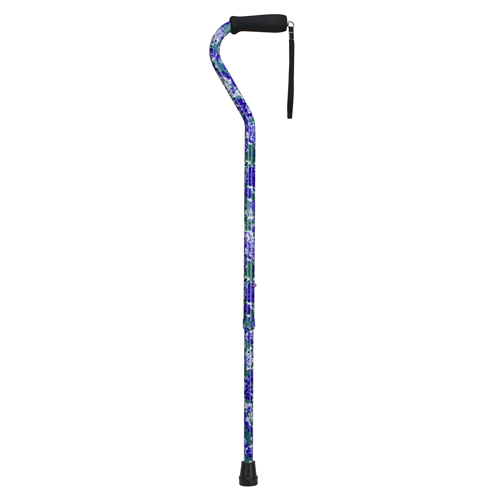 You are buying the Mabis DMI Foam Adjustable Cane Purple Flowers which is manufactured by Mabis DMI. Mabis is a leading manufacturer of Walking Canes. At ADW Diabetes, we do our best to offer the complete product line by Mabis at discounted pricing. Aluminum Adjustable Cane with Cane Strap. Soft foam offset handle.-Slip-resistant rubber tip. Foam grip.-Offset handle style.-7/8'' aluminum tubing. Height adjustable: 31'' - 41'' in 1'' increments.-Positive locking ring .Slip-resistant metal-reinforced rubber tip. Includes: Includes strap for securing cane around the users wrist.